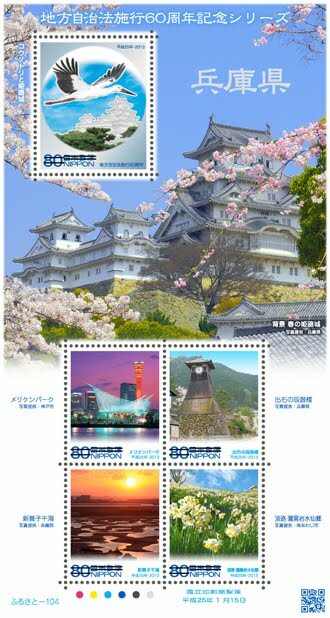 Japan Post Corporation (Chiyoda-ku, Tokyo, President and CEO Shinichi Nabekura) issues a "60th Anniversary series Hyogo Enforcement of the Local Autonomy Act" stamp hometown. Series this stamp is what issued in conjunction with the issuance of money commemorative design of each prefecture 47 to commemorate the 60th anniversary of Enforcement of the Local Autonomy Act, are issued sequentially, in coordination with each county, nature, culture, design has been the subject of tourism and history. This stamp was determined in coordination with those based on the Hyogo Prefecture, suitable as the final design of the stamp. has designed the Himeji Castle, and National Treasure Stork Special Natural Monument. Stork: Stork belongs to the family, adult, the size of the full-length when open approx 115cm, the wing comes out to about 2m. Although extinct, individuals from Japan have succeeded in breeding in captivity by the pair that were transferred from Russia in 60 years (1985) in Hyogo Prefecture in the year Showa 61 (1986) Showa. Moreover, it is since 2005, working on the opinion about the test, now, about 60 feathers before living in the wild. Himeji Castle: The castle was in the year 1346 by Mr. Akamatsu is the beginning, laid the triple tower of Hideyoshi Hashiba is arrived in 1580. After the Battle of Sekigahara, and Ikeda Terumasa arrived in 1600, carried out extensive renovations over the nine years from next year, its current form. Tower building at the time, tower, and gate number has been left, the large ones that span six first basement floor height 31.5m, quintet, large tower, Japan's largest extant tower in particular as You had to. Been designated a national treasure in 26 years (1951) Showa, in five years (1993) Heisei was Japan's first World Cultural Heritage with "Horyuji Buddhist Monuments in the region." in Kobe Maritime Museum and the waterfront and to introduce Kobe Kobe Port Tower is a symbol of the port city, the history of the Port of Kobe will gather, Meriken Park is a landscape representing the Port of Kobe. In addition, the Port of Kobe Earthquake Memorial Park in the park, we have preserved the quay and streetlight was destroyed in the Great Hanshin-Awaji Earthquake, we have also introduced how the damage situation and reconstruction of Kobe Port. in the Drum Tower was built to stand the tower Kadowaki leading Sannomaru old 1871, at the time we tell the time by drum every hour, Drum Tower Dragon is now watch the third generation is at I have been carved. during the spring tide tide draw more than 500m, mudflats vast leading appears also in the whole country, spring shellfish gathering, summer at the beach Shinmaiko crowded with bathing, fantastic illuminated by the setting sun and rising sun Many fans and photographers from around the country seeking beautiful flats. fairyland Wed Kuroiwa Nada, had planted a daffodil wild fishermen did not go fishing sea is rough years ago to about 180 now were blooming on the street is it starts There are several theories, such as wild now as many as 5 million daffodils are blooming area of steep slope of 45 degrees following the sea, over about seven hectares (607.9m above sea level) is located in the southern part of Awaji Island Yuzuruhasan here.